Supporters hope a new law will increase tall wood construction in the state. What do you see when you look at cross-laminated timber? Many in Washington see jobs. Photo: Oregon Forest Resources Institute. License: CC BY 2.0. 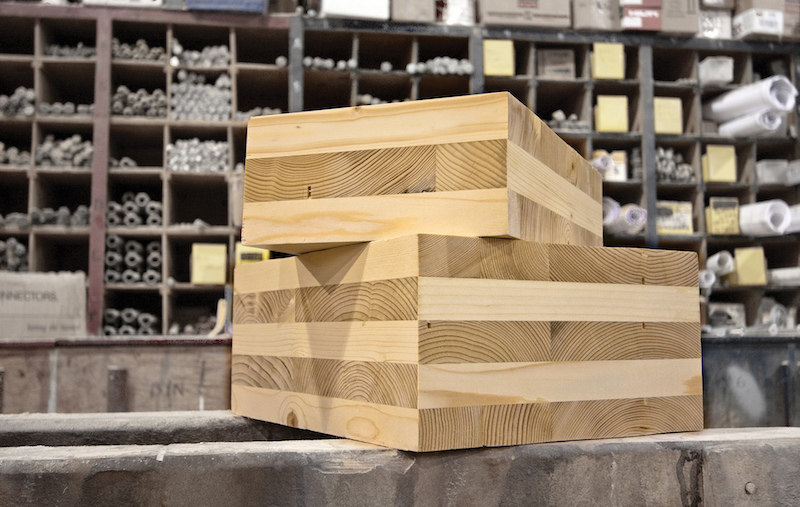 When most people look at cross-laminated timber (CLT), they see blocks of wood glued together. Rural communities in the state of Washington see something else: jobs. That’s a big reason why the state recently adopted legislation designed to recognize mass timber products like CLT in the state building code. CLT and similar materials are composed of multiple layers of wood. They can replace concrete or steel as a structural material, and, depending on forestry practices, they may come with a lower carbon footprint. The new Washington law is simple: it directs the state building code council to write rules governing the use of mass timber in building projects. How does that help? “One of the key areas our coalition has identified as a barrier is building codes,” explained Matt Ojala, director of government affairs at environmental nonprofit Forterra. Forterra leads a coalition of architects, universities, environmental groups, and others in support of mass-timber construction. Although the 2015 International Building Code (IBC), the current law of the land in Washington, permits the use of mass timber for buildings up to six stories, “it doesn’t really allow for widespread use of CLT” because of the height limitation, according to Ojala. An International Code Council ad hoc committee on “tall wood” is looking into new rules for mass timber in the IBC, but the changes, if any, won’t be adopted until 2021. Under the new law, though, taller wood buildings could theoretically be approved in Washington sooner. That’s the hope of state Senator Marko Liisa, Democrat from the 21st Legislative District, who sponsored the bill. “We expect the building code council will create more applications for these products in taller buildings,” Liisa told BuildingGreen. “With the tech boom sweeping Seattle, it would be nice to see some of our homegrown natural resources that are less carbon intensive” being used in construction, he added. Two new manufacturers of CLT recently announced plans to build plants in eastern Washington, according to the Washington Forest Protection Association. As the trend toward tall wood continues and U.S. manufacturers come online, the question of how to ensure sustainable forestry practices remains open. “I think that is definitely the challenge with using more timber products,” Liisa said. “That’s absolutely something we have to be thinking about,” agreed Ojala, who said discussions have begun between the forestry industry and environmental groups about how to manage the issues. “It’s something we’re looking forward to engaging in,” he said.